Cute and sweet like the Sweet 16 guest of honor, these favors make fun gifts and decorations. These unique favors resemble old fashioned 'candy jars' with their silver screw on lids. Personalize them as your own by including your daughter's name and the date of her Sweet 16. Each favor measures 2½" x 1½". Approximately 80 regular size M&Ms® or 70 Jelly Bellies® can fit in a jar. 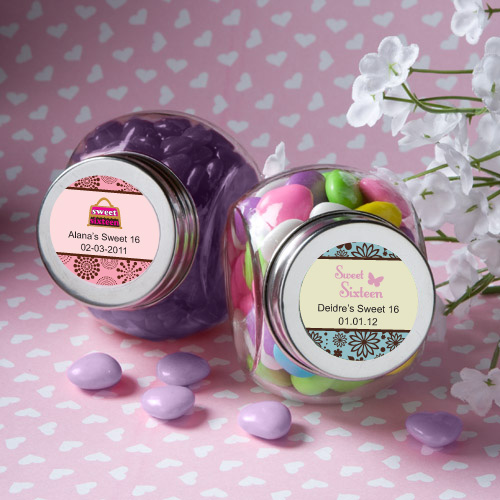 From assorted color combinations, to adorable themed designs that match your occasion, to your own name and date, you can personalize your label and fill the jar with any number of treats to make it your own. Light Up Cups - 3 settings 20 oz.